One lens onto environmental conflict examines the role of long term climate trends on the power and stability of regimes. In a historical context, this regards the rise and fall of empires. But there is no reason to think that today's countries are also not impacted by changing climates and the country's fortunes. A changing climate in the Middle East is said to be one reason that the Assyria Empire slowly declined over time. Drying conditions subtracted from the income and population. These long-term trends have lessons for today. Adam W. Schneider and Selim F. Adali (Climatic Change. December 2014,) argue that the relatively rapid collapse of the Assyrian Empire in the 7th century BCE was in part caused by a period of intense aridity in the climate. The mechanism does have some resonance with the current situation in Syria, which some attribute to a drought there shortly after the turn of the 21st century. 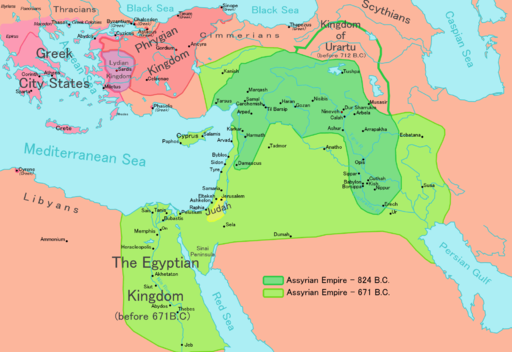 The Assyrian Empire was ascendant starting in the 9th century BCE that lead to control of many parts of the ancient Middle East. This control extended over much of the northern Tigris River plain, now situated around the cities of Mosul Irbil, and cities in Turkey and Syria. Good rain conditions led to a population explosion in Assyria in the 9th century BCE that appear to be directly tied to wetter rain conditions. The same mechanism was seemingly at work with the fall of the Assyrian capital, Nineveh, by Babylonian and the Medes in 612 BC. The good agricultural conditions brought on by better rainfall led to a population expansion in Assyria. The relatively sudden change in water fortunes caused an abrupt disruption of society and economy. It is somewhat similar to the decline of the Maya Empire a millenium later. The authors do not believe this is the main, or the sole reason from the Assyrian decline. Rather, it is part of a more complicated relationship. "Clearly, the process by which the Assyrian Empire declined and ultimately met its demise was complex, and many economic, political, and social factors were involved. In this paper, we seek to highlight two such factors which have not previously been given much consideration: the dramatic and ultimately unsustainable demographic expansion of the Assyrian heartland in the early decades of the 7th century BC, and a regional episode of increased aridity in the Near East during the mid-to-late 7th century, which produced at least one episode of severe drought." Assyria ceased to exist as a geo-political entity with the beginning of Islamic control. Today's Assyrian descendents are largely Christian and have just been expelled from from of their homes by Islamic State forces, if they were so fortunate. Ironically, the area of IS control somewhat mirrors the situation in Syria and Iraq in 2017. Schneider and Adali end with a short reference to current affairs. "In closing, we would like to draw attention to some instructive parallels between the scenario laid out in this paper for the Assyrian Empire’s decline and some of the potential economic and political consequences of climate change in the same area during our own era. One particularly grim example is the connection between severe drought and the development of contemporary political conflict in Syria and northern Iraq (e.g., de Châtel 2014; Gleick 2014), which bears some striking similarities to the relationship we propose between drought and the civil wars which took place in this same region during the Assyrian Empire’s final half-century." The drying of the Assyrian Empire resonates in a number of other conflcit and environment cases. There are historical comparisons. One is the drying of the Sahara, which led to the retreat of peoples to great river systems of Africa such as the Nile and Niger Rivers. These retreats however lead to the rise of urban civilizations and the emergence of early city-states. If we think about Assyria's power fortunes over time as a partial result of climate it is possible to ask what climate change might mean for today's power differentials between countries. Some say Russia and Canada will gain and that Nigeria and Pakistan will lose from climate change. The difference in impact will still lie in countries most dependent of agriculture as income and thus there will be an imbalance between rich and poor that is inherent. The decline of the Assyrian Empire was relatively rapid, especially from such a state of prominence. 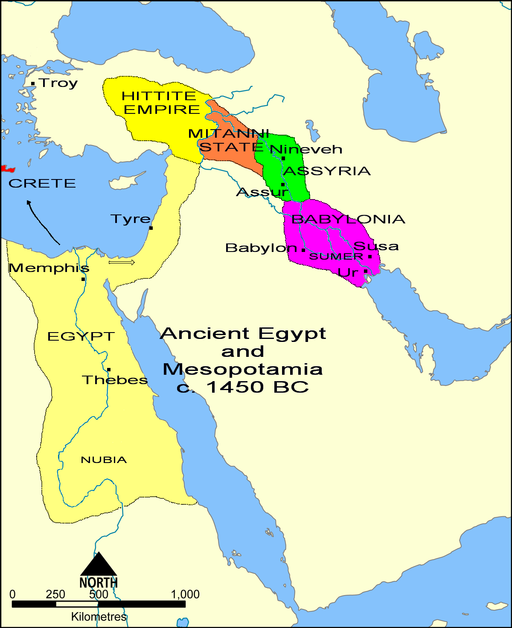 The Assyrian Empire included parts of many countries in the Middle East at differing points in time. Some aspect of the problem was human induced. People contributed to deforestation not only through the direct cutting of trees (see the ICE CEDARS case), but also from the domestication of sheep and goats. These animals suddenly were found in much greater numbers and young saplings and small tree were eaten. There was often no next generation of trees. Schneider and Adali say that "Most of the Assyrian heartland lies in steppe-deserts known as the jazirah, which is a transitional ecological zone between the oak-pistachio forests of the Taurus piedmont in southeastern Turkey and the deserts of central and southern Iraq and Syria (Reculeau 2011)." The high percentage of the population still engaged in subsistence farming made them more open to vagaries in the climate. The drought reduced the economy and therefore, in some way, the military capacity. At it's height, Assyria was the lagest empire the world had ever known. It stretched from Cyprus to Iran and Armenia to Nubia. The armies of the Babylonians and the Medes faced off against Assyrian forces, alongside their Egyptian allies. The Assyrian side was decisively defeated in several key battles. The final fall of Nineveh was a military and a demographic defeat. The case highlights the large-scale impact on national productivity that changes in climate can cause. They will always be tangential or contributory to other key factors in the onset of conflict. This case has long been over but does provide a lesson for considering current conflicts. To some extent, the location is mere coincidence, but this region may well have experienced these trends for thousands of years. Adam W. Schneider and Selim F. Adali, “No harvest was reaped: demographic and climatic factors in the decline of the Neo-Assyrian Empire", Climatic Change. December 2014, Volume 127, Issue 3–4, pp 435–446. Gleick PH (2014) The Syrian Conflict and the Role of Water. In: Gleick PH (ed) The World’s Water Volume 8: The Biennial Report on Freshwater Resources: 147–151.